The shipyard was built in 1227, after the order given by sultan Alaeddin Keykubat. The location of this structure, on the eastern side of the promontory dominated by the huge Alanya fortress, had been carefully selected because of the good lighting of the building. The construction of a shipyard was not only a practical act, but also a symbolic remembrance of the first contact the Seljuks made with the Mediterranean Sea. From the southern side, adjacent to the shipyard, another building was erected - an arsenal (tr. tophane), which was built at the same time as the docks. Its main task was to ensure the safety of the shipyard against any attract for the sea. 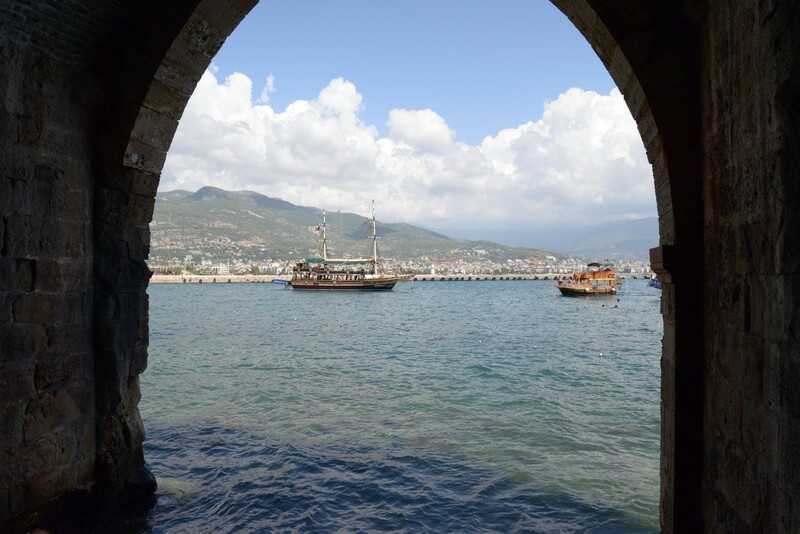 By the construction of the shipyard in Alanya and a similar structure in Sinop on the Black Sea Seljuk sultan Alaeddin Keykubat fulfilled his dream of creating a vast empire which was also a major maritime power. Since then this ruler adopted the title of the master of the two seas. The shipyard was used for the construction and repairs of ships, both in Seljuk and Ottoman times. Even in the 20th century the place was still used by local fishermen. The building was erected of hewn stones and bricks. The shipyard consists of five arched docks with interconnecting passages. Each of these rooms is open to the sea and was a separate shipbuilding station. The shipyard is 57 meters (62 yards) long and 40 meters (44 yards) deep. A commemorative inscription with the name of the Sultan, decorated with rosettes, is still visible at the entrance to the yard. Next to the yard there is a small mosque and barracks, where the guards slept. The shipyards are connected by the passage with the arsenal. It is a two-storied tower, built on a rectangular plan, with sides 14 and 12 meters long, respectively. Today, inside the shipyard there is a small exhibition that demonstrates the history of shipbuilding and maritime navigation in the Seljuk period. One of the most interesting exhibits is the model of a small ship called çekevele. It was a two-mast ship, used mainly as a merchant and communication vessel. However,during sea battles it could be easily transformed into a fast and maneuverable warship. Moreover, the exposition includes a recreated navigator's room, several navigational tools and a collection of anchors. The shipyard is located to the south of the Red Tower, from where you can reach it by following a narrow path for 300 meters (330 yards). The shipyard is open to visitors daily for a nominal fee of 4 TL. There is also a possibility of purchasing a combined ticket for the shipyard, the arsenal and the Red Tower for 10 TL.